In this case, the Kangeswaran police department issued a warning that the Special Operations Department would release the fishermen who were detained. 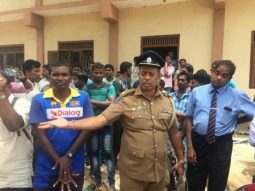 The police have taken the fishermen who were suddenly detained in the wake of the disaster. This further increased the chaos and the conflict between the police and the fisherfolk fishermen caused a tense situation. In the meantime, only six of the eight detainees were arrested. The police were unable to recover the rest and the other two were unable to recover. The other two men were also handed over by a bartender there.